I say ‘us’, but what I really mean is me. It was clear after an initial pass that this was a very recently ‘abandoned’ building, still being used for storage of some kind- with stacks of goods (hammers, picks, brand-new chain-saws, loudspeakers, vacuum cleaners) piled in the foyer just beyond the lobby’s glass wall. I hopped the car-park fence and did a quick circuit of the building, while Mike and Lukas waited by the car. It was Lukas’ first time on a haikyo trip. Earlier that day we’d already been to the BE labs, the only one of three locations I’d google-scouted in advance that I was at all sure of. As it turned out, the hotel we were looking for had been demolished, and the hospital was small and far too difficult to find. I totally understood them waiting by the car. Even though I wasn’t the one to call out ‘Haiyko!’ from the back seat (I think that honor falls to Mike), once blooded on a scent I can’t just give up that easily. Plus I felt somewhat responsible for showing Lukas ‘a good time’, plus for my own sake I didn’t want the whole endeavour to sour out with only one ruin explored, and that one a ruin already visited by another haikyoist with a more popular weblog (counfound you Lee of Tokyo Times with your nearly 4000 readers!). So, I persisted, while the other two drank vending machine tea and probably talked about what a weird and fat person I am becoming. This meant ducking down the side and climbing over a fence, into a dirt-floored open space, sheltered by the building above, like a car-port but instead fitted out with croquet hoops and mallets. 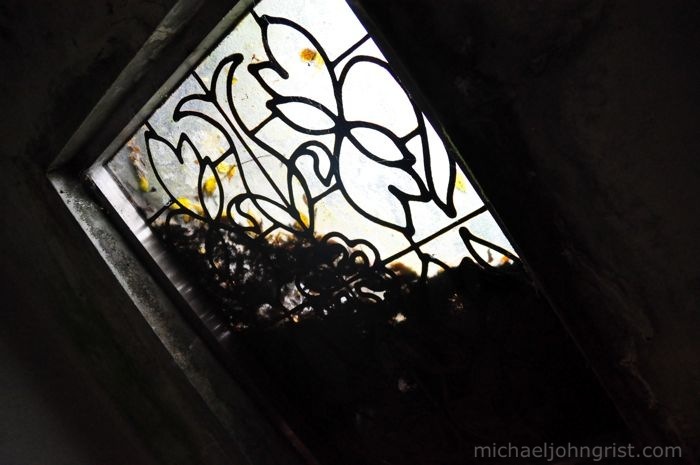 I took a look into the gardens and saw something buried in the dimming trees that imediately made the whole thing worth it- some bizarre slanted concrete bunker surrounded by overgrowth, like a Hatch out of LOST. I gallumphed down there giddy as a school-girl to peek through the half-smashed window. Well, nothing was inside, no entrance to a subterranean lair, just the inside of the shape on the outside, and a nicely decorated window. Still, awesome. Then I looked for a way in to the main complex. Up some external stairs led me to a balcony from which I could wave to the other two, stood by the car wittering about my ridiculous long hair and complaining about how long I always spend in haikyo. I gave them a wave and they immediately fell to looking guilty. I walked out of sight along the balcony, checking each screen door. To my joy, the very last had been left ajar. I poked my head in, out, shook it all about, then went to wave the other two in. There’s not a lot to say about the inside, really. It became clear it was an old person’s home after we saw several rooms filled with wheel-chairs, other medical things, and finally in the basement the gaudy signs reading- ‘ROJIN HOME – 2005’. As with all newly abandoned places, there isn’t much of great interest. We had a look at the piles of gear in the lobby. I tried to turn one of the loud-speakers on but there were no batteries to fit it. Lukas hopped in a wheelchair and tried to wheel down the stairs to the basement but got thrown off on the first step (didn’t happen, I made it up). As ever, there were some photo chances. Any empty place offers an aesthetic different from one that is occupied. There was some interesting art on the walls. 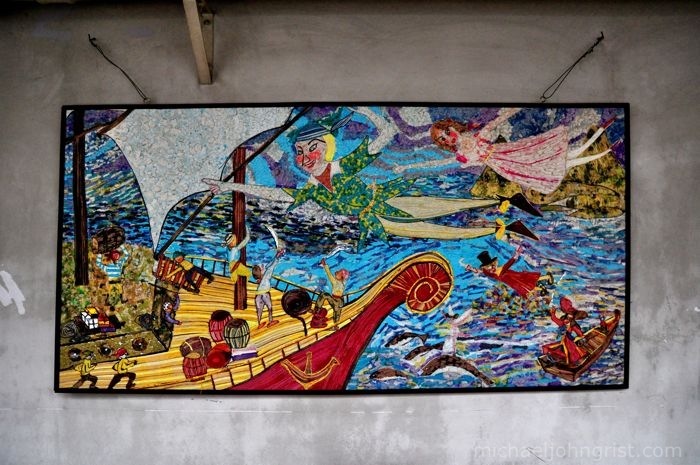 I loved the depiction of Peter Pan and Wendy in one- great for old folks to look at and think- ‘I wish I never aged’. The main hall showed its age in split leather seats, 8-track-style karaoke tapes at the small stage at the front, and a very old rehabilitation wheel bolted to the wall. The wheel was for old folks to stand by and turn, whenever they felt a little feisty, or needed to gently work on their muscles. The ceiling was still decorated with what looked like Christmas decorations. 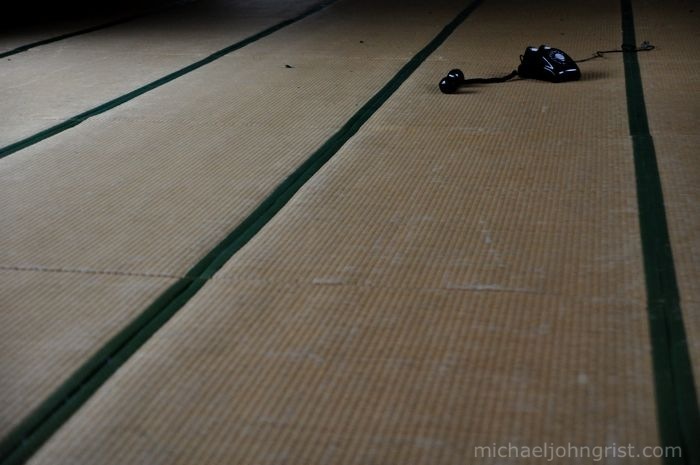 I posed a rotary-phone on the large expanse of tatami to go for the lonely shot. It didn’t take us long to be done with the place. What with it being so freshly ‘abandoned’ and clearly still being used for storage, it didn’t feel right to hang around. Plus there was nothing much to see. After this we continued in our search for the too-small-to-find hospital, buried somewhere in the shadow of an apartment block at some point in a valley. Despite the gathering dark and flagging spirits, Lukas bounced us from the top to the bottom of the valley, breaking multiple times the as yet unwritten but generally obeyed rule- ‘never ask anyone where the haikyo is’. We asked for directions once before, when absolutely stumped on the location of the Russian Village Theme Park, after driving for 5 hours up to Niigata for the express purpose of seeing it. Then- the first person we asked gave us directions directly to it. In fact, as I recall, they actually programmed our GPS to home in on it. This time we had no such luck. Lukas seemed to have a great time getting rebuffed though. At one point he beckoned over a gang of drunken smoking omikoshi-wielders fresh from a local matsuri (matsuri = festival, omikoshi = heavy shrines carried through the streets by gangs of drunken rowdy men) and quizzed them on the location. The lead wielder took this opportunity to alternately call us all crazy weird gaijin, and invite us to the onsen and izakaya for beers with his people. Lukas gave a good show of laughing it all of, even when the wielder accused Lukas of being drunk himself. After about 5 minutes of being harangued, we continued our doomed search. Suffice it to say, we never found the hospital. Rojin Home Haikyo from Michael John Grist on Vimeo. Entry – Over a fence, in through an open screen door. 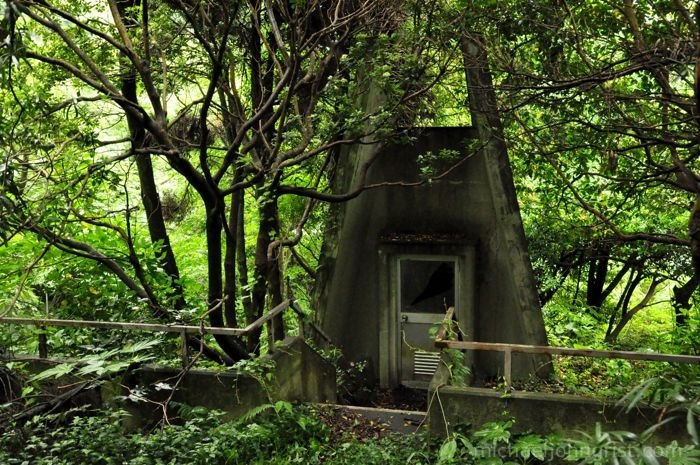 Highlights – The LOST-style bunker in a jungle out the back. You usually get to these places before me Mike, so I deserve the odd one! Glad to see you found somewhere else to visit despite the hospital being elusive. That’s more luck than we had. A couple of haikyo in a day is a pretty good result too I’d say — especially finding a place that hasn’t been photographed before, and isn’t in ‘the book’. It’s possible we were talking about how weird and fat you’re getting yes, but the idea that we were drinking vending machine tea is pure fiction. Glad to see I was given credit for the haikyo call! What does the paper in the sink say? Can, please elaborate on the weird and fat UK is getting. Looks like a good haikyo find, especially for the random one. The hatch was cool as well as the frescoes. As always, more video, was surprised it cut out so soon. Can Mike- I felt it added to the ambience of the piece. Tea is so, how can I say, authentic? Tornadoes- Your guess is as good as mine buddy. We’ll definitely have to do a haikyo together some time. One that neither of us has been to. Don’t know how we’d decide who’d be first through the door though! Actually went to a haikyo I stumbled across by chance yesterday. 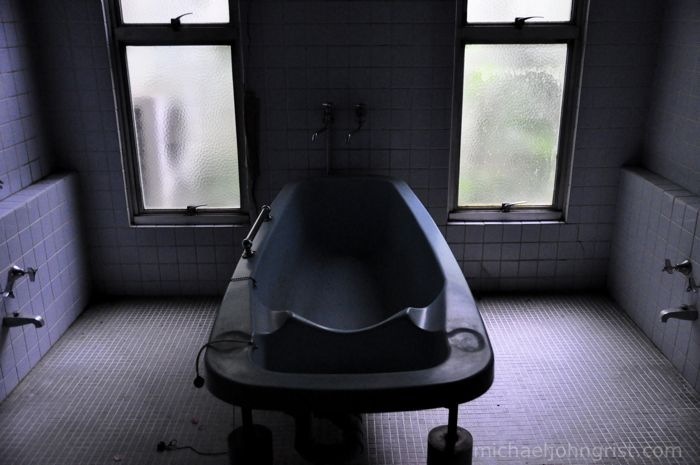 A love hotel that wasn’t abandoned that long ago at all, although luckily it did have a fair bit of character. Plus there was a car parked on the premises forcing us to creep around secretively which added to the fun. I’ll post pics this week and if you are interested I’ll give you directions. Love that picture of the telephone, it just reminds me of the film Audition, just need a body in a sack behind it! Lee- Definitely a haikyo together, just got to either get some fresh tip-offs for a local-ish area, or push the boundaries a bit further out. First through the door, easily solved- enter via different doors simultaneously. Synchronize watches! Love Hotel info sounds good for sure, much appreciated. Seriously though, loving your stuff as always. I hope we get a chance to meet sometime in the near future after I move to Japan this Summer. I will be near Nagoya though. Mike- Hey, am sure we can work something out. Always wonder when you mention haikyo- I think you’ve done some in the uk, is that right?- if you have photos. I look on your blog but find nothing. Are they somewhere to be found? Shizuoka is a gorgeous place, I visited last year whilst in Japan. And LOL at thejapaneseeye… I love your name! !